The Purple Sisters Youth Advisory works to increase awareness of young women’s issues in the community. Issues such as abuse, inequalities in the workplace, legal systems and schools systems are not new, but they are still significant. While progress has been made, we must continue the fight against abuse and inequality with commitment and passion. The Purple Sisters bring attention to these issues in an environment that may otherwise allow them to become overshadowed by more recent and publicized issues affecting women — for instance, those related to sexuality or race. This group partners with young women and the organizations that serve them to offer education sessions, workshops, events and activities that promote an understanding of current women’s issues. 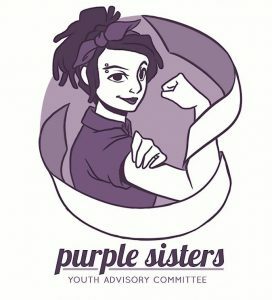 Contact the program coordinator to schedule a youth‑led information session or workshop, to volunteer for the Purple Sisters Youth Advisory, or to get more information about the group.